I am sure we all have a loved one that is hard to by far. Around here, it is often our parents and my husband. Every year it seems I have the same problem, trying desperately to come up with a solution to the what to get them problem. Buying a gift just for the sake of having something to give is awful, I want to find special, personal gifts. Then I heard about the awesome personalized art you can get from Successories. 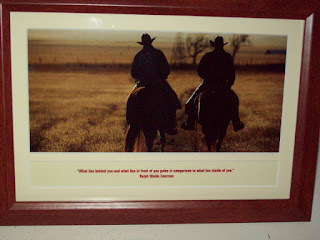 Successories is a company that makes inspirational prints and other great products. I am sure you've seen their work, they are the people to see for inspirational art. Anyway, they now offer you the ability to choose which photo you'd like to use, a quote you love, and even ad a personal message to create a special framed work of art. Your very own DYI art! I thought this is exactly what I need! So, I started browsing for pictures. It's easy to search by category and I soon found the perfect one. From there I just had to write the quote I wanted to use, decide on a personal message, and that was it! It took me all of maybe ten minutes to create the perfect gift for my husband. I am so pleased with the finished product. It is a beautifully framed piece of art. I know that my husband is going to love it and it will look great proudly displayed in our home for years to come! You can make some amazing gifts on this site. I highly recommend them for any of your gift giving needs. Not only do they offer outstanding products, but they ship all gifts within three days of ordering and next day delivery is available anywhere in the U.S. Plenty of time for Christmas! Go check them out for yourself, I just know you will be impressed!